Home Unboxing Xiaomi Redmi Note 7 Unboxing & Hands-on Review: Too good for $179? The Xiaomi Redmi Note 7 has been trending on shopping stores after launching in January 2019. We received a 4GB/64GB variant from the folks at AliExpress, where you can currently get the phone at the cheapest rate on the internet. The Note 7 was launched in China, then later, a version with 12MP + 2MP rear camera found its way to India. However, the one we have with us is the official Chinese Version with 48MP + 5MP AI dual rear camera which I will be testing out later on in this review. I have been using the Redmi Note 7 as my daily driver for almost 48 hours now, and the phone is obviously powerful enough to handle all my daily tasks without any hassle. I’m not much of a heavy user on mobile, so the phone definitely impressed me in terms of performance, power efficiency and camera. The three things I always look forward to on mobile. The Redmi Note 7 comes in a White and Orange mix body carton box. 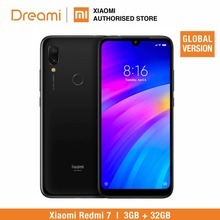 Xiaomi’s Mi logo is seen at the top right corner, while the “Redmi Note 7” body is seen at the bottom. Turning the box under, we can see the highlights of the device which includes the 48MP Dual Rear Camera, Snapdragon 600 chipset and the usual 4000mAh battery. One thing I admired while unboxing the phone, is the gradient body of the phone, because we got the Blue colour variant. Depending on how you flaunt it in the presence of light, you can either get a Blue or light Purple reflection, which is beautiful. The dual rear camera were very protruding, but it wasn’t quite visible immediately I put the device inside the silicone case. Apart from that, I have to admit, this is actually the most beautiful Redmi smartphone there is. There’s also a rear fingerprint, which is very fast enough, as well as the Face Unlock feature which works as well. Underneath the device is the USB type-C slot, which is in-between separated speakers. While at the top, lies the 3.5mm jack and the most needed IR blaster. The SIM slot is by the left, while the volume keys and power button sits by the right. The Redmi Note 7 is built around a 6.3″ 1080 x 2340 IPS display, 409ppi and stretching up to 81.4% screen-to-body ratio. On top of that, there’s a Corning Gorilla Glass 5. Even while outdoors, the display was clear enough without increasing the brightness. I also noticed there’s no way to turn off the waterdrop notch, well, not yet. However, most apps like PUBG Mobile adjusted and automatically turned it off, leaving you with a “Full View” while on the app. It’s powered by the Snapdragon 660 AIE chipset with an octa-core processor clocking at 2.2GHz. I stopped by at AnTuTu and PUBG Mobile, and the Adreno 512 really proved its worth. Speaking of AnTuTu, the device scored an impressive 138,322 and was better than almost 40% of users. As stated above, we got the 4GB/64GB variant, so multitasking was a bliss. Playing the game on the Redmi Note 7 is awesome, you can also play it on HD without lags, compared to Redmi Note 6 Pro. The phone slogan is 48MP Camera Beast, which is evident going by the photos I took with the 48MP + 5MP dual rear camera with AI and portrait modes. I also tested out some AI features which also did justice to the photos. The 13MP selfie cam on the waterdrop notch was tested as well and the selfies came out great. It’s powered by a 4000mAh battery and could support up to Qualcomm’s 4.0 Quick Charge feature. However, it came with a 5V/2A charger, so the full potential of the fast charge couldn’t be tested. Nonetheless, the power consumption was really impressive. I used it for over 5 hours on my normal usage and it was still above 90%. The Xiaomi Redmi Note 7 is a dream for its price, you will definitely enjoy the performance, which obviously no other smartphone in this price range can compete. Even though I didn’t like the protruding dual rear camera and the fact that you can’t hide the waterdrop notch yet, everything else is perfect. Would totally recommend for this price. You will never see the Redmi Note 7 at a cheaper price on the internet, than through the link below, it’s also available in 3GB/32GB, 4GB/64GB, 6GB/64GB and 4GB/128GB. New users will also get $3 off coupon to use on the products below.